Hot Tub Removal Omaha Junk Disposal is an affordable junk removal hauling company located in Omaha NE. We offer Junk Removal, Furniture Removal, Hauling, Movers, Moving Company, Debris Removal, Yard Waste Removal, Demolition, Appliance Removal, Hot Tub Removal, Dumpster Service, TV Recycling, Mattress Disposal, House Clean out, Attic Clean Out, Treadmill removal, Storage unit cleanout, Basement Household Junk Removal, Commercial Junk Removal and Lumber Removal services 7 days 24 hours near Omaha NE Council Bluffs IA. Omaha Junk Disposal is an affordable junk removal hauling company located in Omaha NE. We offer Junk Removal, Furniture Removal, Hauling, Movers, Moving Company, Debris Removal, Yard Waste Removal, Demolition, Appliance Removal, Hot Tub Removal, Dumpster Service, TV Recycling, Mattress Disposal, House Clean out, Attic Clean Out, Treadmill removal, Storage unit cleanout, Basement Household Junk Removal, Commercial Junk Removal and Lumber Removal services 7 days 24 hours near Omaha NE Council Bluffs IA. We take pride in serving our community and your insurance needs. We are locals just like yourself, who understand the challenges that motorist and homeowners face in day to day life. Having the right insurance coverage is the upmost importance to us. We strive to efficiently provide insurance for you and your family that can fit you like a glove! Our seasoned agents have over 20 years experience in the industry. With our experience we look forward in providing the best coverage, such as, SR22 insurance, Non-owners, full coverage, state minimum liability, and any other coverage that keeps your family safe and secure. Partnered with a variety of carriers such as Progressive, Travelers, Dairyland and many more, gives us the flexibility to provide insurance for homeowners, autos, motorcycles, RVs, and Boaters. Ask about our Multi-policy discounts and see how much you can save. We value your time and are happy to giving you a fast free insurance quote for any of your needs with just a phone call. We offer customized services unique to your message. Are you in need of custom shirts for an upcoming event?Created to inspire ideas for unique gift. The creation of an original piece of furniture it an intimate & personal experience. Like you, we are passionate about design. Simple business to tools for exhausted tradesman. Build a better home services business. Your South Carolina appliance professional might handle any or all of the following jobs: selling, installing, repairing and upgrading both small and large appliances. He or she can advise you on the right equipment for your Pendleton, SC home, from features to finishes, and is usually in the know about the latest technological advances and bells and whistles. When appliances hit a snag or start to show their age, a pro can advise you whether to repair or replace them, then carry out his or her recommendation. Some appliance professionals work closely with Pendleton, SC builders, remodeling contractors, and kitchen and bath designers, among others. Here are some related professionals and vendors to complement the work of appliances: Kitchen & Bath Fixtures, Kitchen & Bath Designers, Kitchen & Bath Remodelers, Specialty Contractors, General Contractors. Find an appliance professional on Houzz. 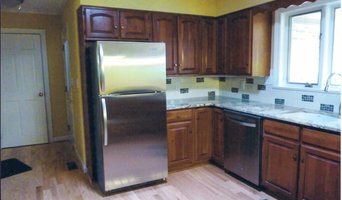 Narrow your search in the Professionals section of the website to Pendleton, SC appliances. You can also look through Pendleton, SC photos to find examples of rooms with appliances you like, then contact the professional who worked on them.